The Personal Property Securities Act 2009 (Cth) (PPSA) confers greater proprietary rights upon a secured party by extending a security interest in collateral to identifiable or traceable property acquired in exchange or substitution for collateral, or proceeds of collateral. This is achieved by an expansive definition of “proceeds” in s 31(1) of the PPSA. To supplement the ability of a secured party to trace into proceeds, the PPSA affords a secured party, rights of temporary perfection over proceeds, and rights of continuous perfection where a registration statement specifically refers to proceeds being covered. Additionally, the PPSA grants a secured party rights of recovery to collateral which has passed to a third party contrary to the terms of a security agreement where the third party does not “take free” of such interest under the provisions in Pt 2.5. Thus, a secured party may adopt a “belts and braces” approach to recover proceeds of a grantor, and divested collateral in the hands of a third party in certain instances. This article analyses: tracing; following and claiming in the remedial sphere of the PPSA; the utility of tracing in priority disputes among secured parties; and tracing against third parties. It also draws analogies with tracing at common law and equity to better understand tracing under the PPSA. Finally, it addresses the tracing of property into derivative assets such as harvested crops and products of livestock, and into new assets, such as manufactured goods, commingled property and commodities. The introduction of civil penalties capable of enforcement by the corporate regulator, the Australian Securities and Investments Commission (ASIC), has created a new landscape for the statutory duties of a director. This has raised questions as to whether the interests of the company and its shareholders will remain the predominant concern, or whether the public interest will intervene. The article considers this potential role for the public interest within the statutory context with particular emphasis on the influence of shareholder ratification and the means by which a director can be relieved from liability under the civil penalty regime. The article further considers the impact of an identity of interest between the directors and the shareholders of a company, and whether ASIC can commence civil penalty proceedings against a director solely in the public interest. Ultimately the article contends that statutory directors’ duties and their enforcement via the civil penalty regime possess a public interest dimension that intervenes with and constrains the interests of the company and its shareholders. The importance of information during the existence of a commercial relationship is widely accepted. However, the extent to which disclosure of information is mandated, or the mechanism which is used to achieve disclosure of information, depends on the particular legal discipline. Corporate law, for example, attempts to achieve disclosure through the statutory doctrine of continuous disclosure. Contract law provides a different mechanism and courts have historically used good faith to ensure disclosure of information, ultimately leading to the duty to act in utmost good faith. 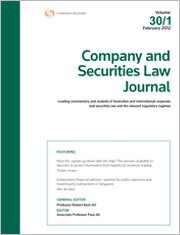 This article provides an overview and analysis of these different mechanisms, and proposes that the concept of good faith could fulfil a valuable, complementary function in the context of continuous disclosure in the corporate law arena. Ultimately, this may contribute to fair dealing towards the investing public by the company and those in control of the company, when complying with the continuous disclosure obligation. For the PDF version of the table of contents, click here: WAU – C&SLJ Vol 32 Pt 6 Contents or here: CP – C&SLJ Vol 32 Pt 6 Contents.